I’ll be honest, I tried to launch my first store for 12 months! I followed the usual way to begin with. … and never made a sale. Today, after just selling my eCommerce project with $3M annual sales and 7 eCommerce stores in my CV, I understand what I did wrong and found a way to fix it. I did what most people do — I concentrated too much on creating a great looking store instead of actually trying to make a sale. People think that if you are launching an eCommerce business that you should do it the hard way. They think that you should never launch a poorly developed store, or that you should try to land a super deal with a wholesaler long before making any actual sales. But what I have found is that it’s much more productive to learn and create along the way. Your first step is to simply create you store. 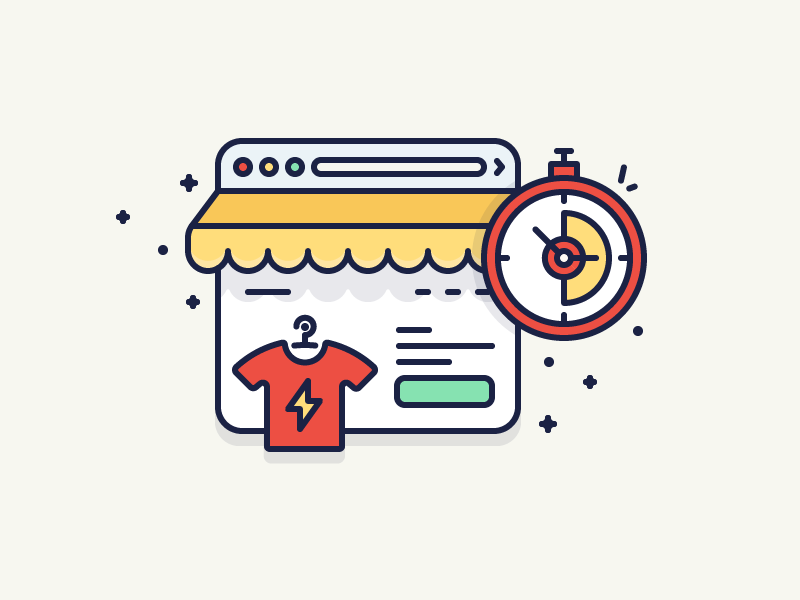 Once your store is up and running, you can explore ad campaigns and logo designs at a later time. As my favorite quote says: “Get going, get better”. Below I’m sharing a detailed tutorial on how you can launch your first eCommerce store in under 30 minutes with dozens of products. It won’t be perfect, but it’ll be exactly what you need to get going. In this example, I will build a full category women’s clothing shop that sells non-branded funky clothes. I strongly suggest that you follow the guide as it is written and try implementing additional features and ideas later after your launch. Picking a name shouldn’t be a huge concern right now. Think of something random and simple. For my women’s clothing shop I came up with: Forest Store, Hill Hill Store, MarsIn1999. I recommend adding ‘store’ or ‘shop’ because you will need to find an available internet address (domain), and it’s easier to find an available one when there are several words in the name. In the olden days, you had to get a server, upload an eCommerce system to it, hire someone to change it according to your needs, and pay to maintain it. It was expensive, time consuming, and the final result was still a slow and ineffective website. Thankfully, Shopify and other alternative softwares has simplified the process. You can create your store in just a few clicks and all of the server setup and maintenance is taken care of for you. Add your PayPal email address under the Shopify Settings, Payments Section. Later, you can change, remove, or add additional payment options. If you don’t have a PayPal account, registration at PayPal.com will take about 5 minutes. Shopify offers a handy tool for generating terms and conditions, standard privacy, and return policies. Just go to Shopify Settings, Checkout, and scroll down to the Refund, Privacy, and TOS statements section to generate each policy sample. The sourcing tool I will recommend to you will offer most of the products with a free delivery option. So I suggest adding a free shipping rate for all of your orders as well. Go to Shopify Settings, Shipping, and delete all shipping zones that are non-international, and edit the international zone rate to Free. Shopify allows you to sell your products across multiple channels like Online Store, Facebook Store, Brick and Mortar store, etc. We want to create an online store now. Go to Shopify Settings, Sales Channels and add Online Store as your sales channel. Buying a domain is optional. Currently, your URL looks like [storename].myshopify.com. But you might want to change it so it will look more normal: [storename].com. You don’t have to do this right away, and there will be a cost (about $13 per year). You can set this up later once you decide if you want to invest further money into your business. It is important to note, however, that a custom internet address provides social accountability when you start advertising your site, which can increase your sales significantly. To buy a domain, go to Shopify Online Store, Domains Section, and click Buy New Domain. P.S. You’ll need to confirm the domain before it starts working. The confirmation letter is in your email inbox. A traditional eCommerce model can work like this: first you buy several hundred products, wait for them to be delivered, stock them in your garage or a small warehouse, and when someone places an order you ship them to your customer. This traditional model works well for bigger companies, but for new companies, this model can have extra costs (storage space), risks (unsold stock), and annoyances (not having a popular item in stock and ready to ship). There is an alternative to this model: the dropshipping model. Dropshipping allows you to save time and money by buying a product only after you sell it in your store. You simply add products to your store, and when an item sells, you pay the supplier who then ships it directly to your customer. There is no need to pay for extra storage space and no need to worry about what to do with unsold stock. Contact wholesalers and land a dropshipping deal. You will soon realize that it is hard to find good suppliers who provide dropship services. If you find a company, they will usually only do business with an established, profitable business. This is not the best option for a startup business. Use sourcing tools and apps. You connect your store with the app (see recommendation below) and import products directly from a dropshipped products database within minutes. There are several dropshipping apps, but I would suggest downloading the free trial from Ali Importer. Ali Importer is an app that allows you to import dropshipped products from AliExpress to your store within minutes. Items sold in your store will be shipped directly to your customers in just a few clicks. AliExpress offers a wide variety of products at very low prices, which is why it is an ideal partner in the beginning when you launch your store. Product categories are called collections on Shopify. I’ll be selling women’s clothing so my collections will be (from top to the bottom): Hats, Shirts, Jackets, T-Shirts, Hoodies, Pants, and Accessories. Just go to Products, Collections, Add New Collection, and then enter your collection name and select your collection conditions. Adding products with Ali Importer is simple. There are several different import methods, but the fastest way to do this is to go to the Ali Importer Featured Categories page and import entire product categories. The video below shows me installing the application from the Shopify App Store and importing a featured category of women’s clothing. Alternatively, you can just use the in-app search and import products individually, one by one. Content is extremely important. This is an area that you should focus on and spend more time on in the future. However, the following sections should be enough to start with: About Us, Terms and Conditions, Privacy and Returns Policy, Shipping & Delivery Information, Track Your Order link, and Contact Us. To create a page, go to Shopify Online Store, Pages, and click Add Page. This page eventually needs to be unique, but this will take quite a bit of time. In the meantime, copy and paste one of the pre-generated ‘About Us’ pages from the list below and edit it to suit your store later. Most of the sellers on Ali Importer have very similar delivery prices and timeframes, so it is best to copy and paste this standardized shipping & delivery page. You may remember that these pages were generated during the first step of this tutorial. Simply copy them from your settings page and paste into separate articles. Keeping in close contact with your customers is very important. Make sure you place a clearly visible ‘Contact Us’ link on your store. To create a contact page, click the Add New Page button and change the page template to contact. Go to the Shopify Online Store, Navigation section, select edit ‘Main Menu’ card, and list all your collections there. You can create a cool looking banner in just a few minutes. Google ‘banner editing tools’ or click here: Canva.com. Select banner dimensions (1200x360px), upload an image of one of your products, select background, insert a few lines of text, add a ‘Buy Now’ button, and you’re finished. You can now insert this banner into your store by going to Online Store, Themes, Customize Theme, and editing Homepage Slideshow. Don’t exit the Customize Theme section and head to Home page and then Home page — featured collection subsection. There you can select which products to show under the main banner. You can find Footer Settings in Online Store, Themes Section, Customize Theme page, and Footer Settings. There you can decide what you want to see in your footer menu. I usually hide ‘Latest News column’, because we don’t have any news yet. Congratulations, you have just launched your first store! Although it didn’t take a long time, it is still an excellent achievement. You are now an entrepreneur, running your own store. You should also remember that launching a store does not guarantee success. Owning a business is about trying to improve your sales, customer service, your customer experience, and most importantly, yourself. Write down a list of things you want to achieve with your business, and begin the learning process. Begin by committing one hour every day so that you can further edit your website, find new ways to boost sales, and learn how to grow your business.